See also: Category:Christian religious orders established in the 12th century. See also: the categories Christian monasteries established in the 11th century and Christian monasteries established in the 13th century. Pages in category "Christian monasteries established in the 12th century"
The following 200 pages are in this category, out of approximately 612 total. This list may not reflect recent changes (learn more). Averbode Abbey is a Premonstratensian abbey situated near Diest, in the Archdiocese of Mechelen-Brussels in Belgium. Averbode Abbey was founded about 1134–1135 by Arnold II, Count of Loon, the first canons and abbot Andreas came from the Sint-Michielsabdij in Antwerp, founded in 1124. The abbey started rather small but grew over the centuries, until it was some 5500 ha in the century, including farms, woodland, heath. The abbey provided the priests for 27 parishes, the first abbey church was inaugurated in 1194, and soon after the nuns, who until resided in Averbode as well, moved to Keizerbos, where it stayed until it disappeared in 1796. New buildings were erected all the time at the abbey, the gatehouse, built at the end of the 14th century, is the oldest remaining building. The church and part of the abbey was destroyed by a fire after a strike on October 25,1499. The abbey went through a period in the first half of the 16th century. The church was rebuilt and richly decorated and plundering troops made it necessary to flee the abbey four times in this period. Political and religious instability in the half of the century, with the Beeldenstorm. The death of 12 monks in 1579 because of the bubonic plague reduced the abbey to only 28 monks in 1584 and they returned to Averbode only in 1604. The seventeenth century saw a return to strength of the abbey, between 1664 and 1672, a new church was built. Almost all the buildings were rebuilt during this century, at the end of the 18th century, in 1789, the Brabantse Omwenteling started a period of great political turmoil, with the French and the Austrians fighting for control over Brabant. Travelling troops heavily damaged the abbey, after the French disbanded most abbeys on September 1,1796, the canons of Averbode were evicted on February 14,1797. Most parts of the library and the archive were brought to safety beforehand, in 1802, brother Ignatius Carleer bought the abbey and some monks were able to return. The church was used as church for Averbode. Because of financial problems, most of the treasure had to be sold. Aslackby Preceptory in Lincolnshire lay to the south-east of Aslackby Church. Until about 1891 a tower, possibly of the church, together with a vaulted undercroft. Temple farmhouse was rebuilt and a 15th-century window and a stone pinnacle remain in the garden The preceptory was, according to William Dugdale. After the order was suppressed in the first decade of the 14th century, the word preceptory is used for the community of the Knights Templar which lived on one of the orders estates in the charge of its preceptor. From that its meaning was extended to include the estate and its buildings, the one at Aslackby was founded in 1192. This was a design for Templar churches, in imitation of the Church of the Holy Sepulchre in Jerusalem. The best-known example in England is the Temple Church at the end of the City of London. Later, towers were built at both the Lincolnshire churches, the one at Aslackby apparently around 1200, on the side of the round nave. In 1192 there was already a village with a small castle, the honour of Craon was divided, and one third of a knight’s fee was granted to the Templars who managed it from Aslackby CW - U. T.
When the order was disbanded in 1312, most of the property was transferred to another order, whereas the Templars had been established to protect people on pilgrimages to Jerusalem, the Hospitallers had the additional concern of providing accommodation for them. Under the Hospitallers, the equivalent of a preceptory was a commandery, after 1312, the property was managed by leasing it out. In 1539, the buildings were said to be in ruins, after the Hospitallers houses in England were dissolved, the Aslackby lands were transferred into the secular hands of Lord Clinton. In 1789 Richard Gough in his revision of Camden states that the Preceptory might only have commenced when John Le Marshall and he goes on to state ‘‘Here was round church, now rebuilt as a farm house, and still called the Temple’. This would suggest that there was a memory of a round church, similar to Temple Bruer Preceptory. Shortly after this in 1791John Byng the diarist, who became Viscount Torrington and he records a turreted building and I was civilly shewn into the lower room, now a dairy, curiously arch’d with stone, and with coats of arms in the centre. Barlings Abbey, was a Premonstratensian monastery in England, founded in 1154. Its founder was Ralph de Haye, son of the constable of Lincoln Castle and it was first established at Barlings Grange but was soon moved to its present site, previously called Oxeney in Lawress wapentake of the West Riding of the Parts of Lindsey. By 1497 the situation had improved with the abbot praised for his administration, sir John Rochford constable of the Bishop of Elys castle at Wisbech and his wife Alice are believed to have been buried at the abbey. See Blomefield, Hist. of Norfolk 4,712, in 1537, during the Dissolution of the Monasteries, the abbey became involved in the uprisings against this act and the abbot, Matthew Mackarel, and six of the canons were subsequently executed. The abbey was closed and the remainder of the canons expelled with little compensation due to the activities of their condemned brethren, sections of the cloister range stood until 1730 as did the impressive central tower of the church which finally collapsed in 1757. Basingwerk Abbey is a Grade I listed ruined abbey near Holywell, Wales. The abbey, which was founded in the 12th century, belonged to the Order of Cistercians and it maintained significant lands in the English county of Derbyshire. The abbey was abandoned and its assets sold following the Dissolution of the Monasteries in 1536, the site is now managed by Cadw - the national Welsh heritage agency. The abbey was founded in 1132 by Ranulf de Gernon, 4th Earl of Chester, the abbey became part of the Cistercian Order in 1147. It was a house of Buildwas Abbey in Shropshire. An Earl of Chester gave the manor of West Kirby to the Abbey, the abbey had extensive links with the English county of Derbyshire. Henry II gave the monks a manor near Glossop, the Monks Road and the Abbots Chair in the town are a reminder of the Abbeys efforts to administer their possession. In 1290 the Abbey gained a charter for Glossop. The monks got another charter for nearby Charlesworth in 1328, in 1157, Owain Gwynedd encamped his army at Basingwerk before facing the forces of Henry II at the Battle of Ewloe. The Welsh Prince stopped at the abbey because of its strategic importance and it blocked the route Henry II had to take to reach Twthill, Rhuddlan. In the fighting followed, Owain Gwynedd split his army routing the English near Ewloe. By the 13th century, the abbey was under the patronage of Llywelyn the Great and his son Dafydd ap Llywelyn gave St Winefrides Well to the abbey. The monks harnessed the power of the Holywell stream to run a corn mill, in 1433, the monks leased all of Glossopdale in Derbyshire to the Talbot family, the future Earls of Shrewsbury. A legend says a 12th-century Basingwerk Abbey monk was lured into a wood by the singing of a nightingale. He thought he had only been listening a short while, but when he returned and he crumbled to dust shortly afterwards. In 1536, abbey life came to an end with the Dissolution of the Monasteries during the reign of Henry VIII and its dissolution was made lawful by the Dissolution of the Lesser Monasteries Act and the lands of the abbey were granted to lay owners. Aberconwy Abbey was a Cistercian foundation at Conwy, transferred to Maenan near Llanrwst, and in the 13th century was the most important abbey in the north of Wales. A Cistercian house was founded at Rhedynog Felen near Caernarfon in 1186 by a group of monks from Strata Florida Abbey. About four or five years moved to Conwy. Llywelyn was regarded as the founder of the house, and thanks to his support it came to more land than any other Welsh abbey. On Llywelyns death in 1240 he was buried at the abbey, in 1282, Edward I of England surrounded Snowdonia with a massive army. On 11 December Llywelyn ap Gruffudd, Tywysog Cymru, was lured into a trap, in 1283 King Edward I of England obliged the monks to move from Conwy to Maenan, further up the Conwy valley, so he could construct a castle and walled town at Conwy. The move had been completed by 1284, with Edward financing the building of a new abbey. In the 15th century the abbot, John ap Rhys, became involved in a dispute with Strata Florida Abbey and led some of his monks, the abbey was valued at £162 in 1535 and was suppressed in 1537. Berne Abbey, a Dutch abbey of the Premonstratensians, or Norbertines, in Heeswijk, North Brabant, is the oldest extant religious community in the Netherlands. It has 27 brothers and priests, the community publishes a bi-monthly magazine called Berne. Since March 2007, Ward Cortvriendt has been the 70th abbot, in 2009 the abbey celebrated its 875th anniversary. Besides the professed members the abbey has people who feel closely connected with the community, participants of the group Ruach, the community of Berne. One is that Fulcold, when pressed in battle, made a vow to build an abbey, if, by throwing himself into the river Maas. This prayer having been heard, Fulcold converted his castle at Berne into a monastery, blessed Fulcold died on April 12,1149, on which day his name is recorded in the hagiology of the Premonstratensian order. 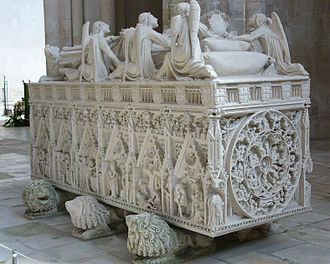 Fulcold initially brought Augustinian canons from Rolduc Abbey to Berne to start the monastery, but was dissatisfied with their lack of discipline and he made another attempt at a foundation in 1134 with the newly established Premonstratensian Order, called Norbertines after their founder Norbert of Xanten. From the nearby Mariënweerd Abbey an abbot and some canons were sent to his castle and this time Fulcold himself joined the community. His wife, chose a life in Berne and in the monastery of Altforst. The appointed guardians of the abbey were at first the dukes of Cleve, in 1248 the dukes of Brabant took over this duty and finally in 1399 the counts of Holland and the Dukes of Guelders. Berne Abbey has always held in high esteem, as is proved by the privileges which were granted to it. It possessed the right of patronage over nine parishes, which were served by priests from the abbey. In comparison with the monastic foundations in Germany and Belgium. After a century of existence the monastery changed its direction, the strict monastic period ended and the focus shifted now from works in the monastery to work outside the abbey. Not only the authority, but the spiritual authority of the abbey grew, making it a spiritual. Priests were sent to parishes and the given to the abbey. In this way the village of Berlicum came into the possession of Berne Abbey in 1240, in 1285 Oudheusden, Hedikhuizen and Engelen were added to them, and in 1369 Bokhoven, in 1613 Lithoyen, in 1846 Haarsteeg, and in 1948 Middelrode. Alvingham Priory was a Gilbertine priory in St. Mary, Lincolnshire, England. The Priory, established between 1148 and 1154, was a house, where religious of both sexes lived under the same roof. They did not commonly communicate with one another, and there was a wall dividing their priory church. The priory has left few visible remains, St Adelwolds church is the only church in England which is dedicated to St. Adelwold. St Marys Church was originally a chapel belonging to the priory and it became the parish church of North Cockerington at the dissolution and is now under the care of the Churches Conservation Trust. The cartulary of the priory is preserved at the Bodleian Library, the priory was active until most of its inhabitants died from the Black Death. Men and women continued to join the house until the sixteenth century all the monasteries of the Gilbertine Order were dissolved. 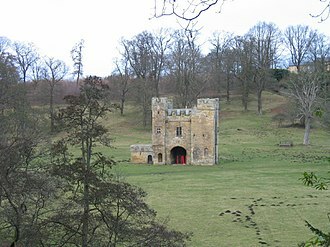 Following the surrender of the house on 29 September 1538 pensions were paid to twenty people, a prior, seven canons, Alvingham Priory was located until its dissolution in Alvingham village. The village is mentioned in the Domesday Book, the village is surrounded by agricultural land, and lies on a small back road leading east out of Louth, called Alvingham Road. In the eighteenth century, a canal, the Louth Navigation, was constructed near the priory site, it survives as a drainage system. 12th century The Gilbertine priory of St. Mary, was founded as a house between 1148 and 1154, possibly by Hugh de Scotney or one of his tenants. The founders were possibly Hugh de Scotney or William Friston Another possible co-founder was Hamelin Alvingham who made substantial donations to Alvingham Priory. He is known to have resigned from his deanery and joined Alvingham Priory as a canon, the monks wore black, with white cloaks, and generally were shaven. Hamelin, the dean, gave three parts of the church of St. Adelwold of Alvingham, the part having been given by Roger Fitz Gocelyn. In view of this endowment, St. Gilbert limited the number of inmates to eighty nuns and lay sisters, a wise compact with the neighbouring Cistercians house of Louth Park in 1174 provided against that most fruitful source of strife, the acquisition of lands. Princess Adelaide of Saxe-Meiningen (1792 - 1849), consort of William IV, spent her final years at Bentley Priory. Air Chief Marshal Sir Hugh Dowding accompanying King George VI and Queen Elizabeth during a visit to Bentley Priory in September 1940. Plan of the Betania monastery per Prince Grigory Gagarin, 1847. Balamand Monastery, known as the "Pearl of the East."